When it comes to popular drinks, Poland has a lot to offer. From delicious soft drinks to top of the class alcoholic beverages, Polish drinks are varied and tasty. In Krakow bars, you will find a wide range of quality beer and vodka, which Poland is famous for. If you do not drink alcohol, there is plenty of other Polish drinks to choose from. Beer has been brewed in Poland as long as the state itself exists. Today, it is still the most popular alcoholic beverage. Coming in many types, beer is the favourite choice amongst tourists and locals alike. The most popular in Krakow bars are lagers, but go ahead and try various types of beer. Do not hesitate to discover new brands. In recent years many small breweries opened, putting quality over quantity. Nonalcoholic beers are known in Poland, but very rarely drunk. Poland is, of course, the land of vodka – 40-45% strong alcoholic beverage. Vodka is too coming in various types, from absolute (czysta in Polish) to flavoured. Although it is easy to see drinking vodka as a way to quick inebriation, good vodka is, in fact, a delicacy. 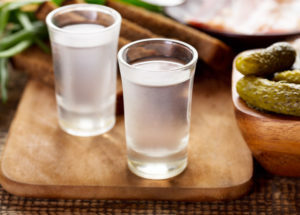 There are many customs revolving around vodka, from the saying that you are not friends with someone unless you drank vodka together, to the typical and only right way to drink it in one shot. Polish people do not really drink cocktails, preferring pure alcohol or wine. You will, of course, find a wide variety of cocktails in good Krakow bars. Wine gained in popularity in the past decade and you can be safe to assume to be served good quality wine in a restaurant or a bar. A very unique Polish alcoholic beverage is nalewka – a tincture-like drink. Nalewka is usually 40-45% and made through maceration of vodka or spirit with fruits, herbs, spices, roots, sugar or honey. For the nalewka to achieve the best taste it needs to age. Although coffee is one of the most popular drinks in Poland, the number one soft drink is tea. Tea is the beverage choice of the Poles for virtually any time of day and there are a lot of types to choose from. You can have a cup of tea with breakfast or with something sweet for lunch or in the evening to warm up after a full day outside. Tea is sometimes served with a slice of lemon and sugar or honey. Typical Polish soft drinks are also compotes (kompot in Polish). Kompot is a sweet beverage served hot or cold and made by cooking fruit in a large amount of water, sweetened with sugar. The fruits used are most often apricots, peaches, apples, rhubarb, various types of cherries and berries. Kompot was very popular during the communism in Poland, due to food rationing. Although its popularity has been declining, kompot is regarded as the real taste of Polish home. 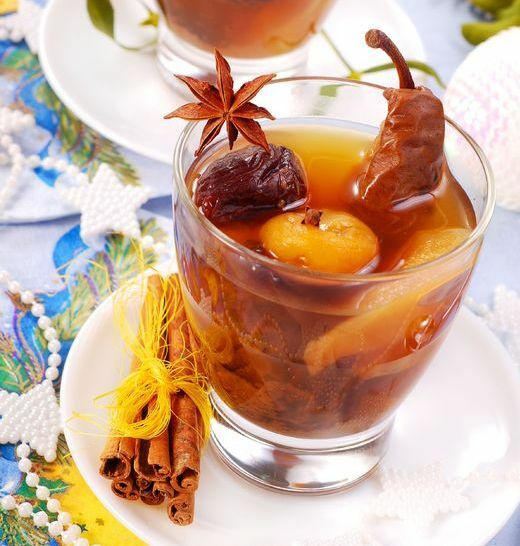 A seasonal, unique type of is kompot z suszu, prepared for Christmas from dried fruit.